In this study, bacterial strains were isolated from curd and evaluated its bactericidal potential against two aquatic pathogens Salmonella sp and Vibrio sp isolated from marine fish, Parastromateus niger and squid, Loligo duvauceli. Based on the antimicrobial activity, potential strain was selected and identified as Bacillus sp. Further, bacteriocin was partially purified from the Bacillus sp by ammonium sulphate precipitation and dialysis. The molecular weight of the partially purified bacteriocin was estimated by SDS-PAGE. To understand the biopreservative ability of the purified bacteriocin, tissues of Salmonella and Vibrio-infected fish, Parastromateus niger and Loligo duvauceli were treated with bacteriocin for 30 days at different storage conditions (-4°C and -20°C) and the microbial load was counted at 5, 10, 15, 20, 25 and 30 days. Results showed that bacteriocin significantly reduced the total bacterial count at both storage temperatures in a time dependent manner. This study proved the efficiency of bactericidal and biopreservative activity of bacteriocin isolated from Bacillus subtilis (KY808492). Seafood is consumed by humans for their nutritive values which prominently include fish and shellfish. Shellfish include various species of molluscus, crustaceans etc. (WHO, 2002). Generally, seafood can be associated with m bacteria produce a wide range of antimicrobial products from low molecular weight compounds such as hydrogen peroxide and carbon dioxide, to high molecular compounds such as bacteriocins (Roy, 1997). These bacteriocins exhibit antibacterial activity against many seafood pathogenic bacteria including gram positive and negative and hence it has been used as a bio-preservative (Aymerich 2000). Some bacteriocins are synthesized commercially in industries and are used as a natural biopreservative. The present study aimed to screen the potential probiotic strain from curd with bactericidal and biopreservative potential. Marine fish, Parastromateus niger and squid, Loligo duvauceli was collected from local fish market in Chennai, India and the infected fishes were picked. To isolate seafood pathogens such as Salmonella sp and Vibrio sp the infected fish tissues were smashed and the extract was spread over specific media such as SS agar and TCBS agar (HiMedia) respectively and the isolated pathogens were confirmed by biochemical tests (Lee, 2008). To isolate probiotic bacteria, curd sample was serially diluted up to 10-6 and inoculated in the specific media MRS agar medium (HiMedia) and incubated for 48 hrs at room temperature. After the incubation period, morphologically different colonies were selected from the MRS agar plates and each strain were individually streaked in MRS agar plates and incubated for 48 h at room temperature. To determine the antimicrobial activity of all the isolated probiotic bacterial strains, they were tested against the seafood pathogens, Salmonella sp and Vibrio sp using agar well diffusion method (Wilson, 2016). The probiotic bacterial strain which showed the zone of inhibition (ZOI) against the tested sea food pathogenic bacteria was potentially selected subcultured individually in MRS agar plates. The strain was inoculated separately in 50 mL of MRS broth (pH 6.8) for extraction of bacteriocin, all the culture supernatants were centrifuged at 6000 rpm for 30 minutes at 4°C. The cell free supernatant was precipitated with ammonium sulphate (40% saturation) and kept for 2 h at 4°C, and later centrifuged at 10,000 rpm for 20 minutes. After centrifugation, the precipitate was obtained and resuspended in 10 mL of 0.05 M potassium phosphate buffer. The molecular weight of the bacteriocin was determined by Sodium dodecyl sulphate polyacrylamide gel electrophoresis. 10 mL of the separating gel taken, mixed well and immediately poured between the plates till the level is about 2 cm below the top of edge of notched plate. After the gel set, the top of the separating gel washed with distilled water. 5 mL of the stacking gel prepared and immediately poured on the polymerised separating gel. The comb inserted into the gel solution carefully without trapping any air bubbles 1 cm above the separating gel. After the gel is formed the samples were loaded into the wells. The chords were connected to the power supply and the voltage set between 50-100 V and switched on. When the dye front reaches 0.5 cm above the bottom of the gel, it placed in the staining solution for 1hr and then placed in the destaining solution until the bands are clearly observed. Agar plates were swabbed with 100 μl of both seafood pathogenic bacteria after growing them in a broth. Once the plates were dried aseptically, 5 mm wells were bored using a sterile cork borer and about 10 μl of (extracted bacteriocin) supernatant was placed into each well. Then the plates were incubated for 24 h at 37°C. After the incubation period the antimicrobial activity was determined by measuring the diameter of the ZOI around the wells. The strain which showed the maximum inhibition zone against the tested seafood borne pathogens is taken for the mass scale production of bacteriocin (Wilson et al., 2016; Quanli et al., 2012; Karthik et al., 2013). The bacteriocin of potential strain which showed the strongest antimicrobial activity against seafood borne pathogens was chosen for mass scale production of bacteriocin. The culture was inoculated in 1000 mL MRS broth (pH 6.8), after the incubation period the bacteriocin was isolated by following the aforesaid procedure. The potential probiotic bacterial strains were subjected to biochemical examination and based on the results they were identified by using Bergey’s Manual of Determinative Bacteriology (1989). Further identification was done by 16S rRNA sequencing. PCR was used to amplify the 16S ribosomal DNA and was determined by direct sequencing. Total DNA was isolated SoluteReady® genomic DNA purification kit. Agrose gel (2%) was used to isolate 16S rRNA. 16S rRNA was separated by gel electrophoresis on gel made with 2% acrylamide and bisacrylamide. To determine the biopreservation activity of bacteriocin, infected fish tissues from Parastromateus niger and Loligo duvauceli were collected and taken into two groups. One group of the tissue samples were stored directly and other group of the fish samples were dipped in cold distilled water containing bacteriocin produced by the strain, and both the treatments were packed in sterile polyethylene bags and stored at different temperatures at -4°C and -24°C for 30 days. The tissues that were stored without bacteriocin treatment served as control. Stored tissue samples were taken randomly from both treatments at different time intervals (5th, 10th, 15th, 20th, 25th & 30th day) and homogenised using mortar and pestle. 10 g of the sample was mixed in 90 ml of sterile distilled water and this suspension was serially diluted up to 10-4. For the analysis of Total Heterotrophic Bacteria (THB) Nutrient agar medium (HiMedia) was used. Salmonella sp and Vibrio sp were enumerated by using SS agar and TCBS agar respectively. All the experiments were performed in triplicates (Karthik et al., 2013). Modern technologies in food processing and implementation of food safety standards have reduced the loss due to food spoilage and the related food-borne illness. However, the chemical based preservatives and food additives have their own side effects which emphasize the importance of using natural preservatives. Marine fish products are a major category of frozen foods which is an important business with huge commercial values. But the spoilage caused by bacterial pathogens is a major threat in this industry which requires a better preservative. Biopreservatives are one of the natural preservatives in which non-pathogenic microorganisms and/or their metabolites are used to improve the safety and shelf life of foods (Galvez et al., 2007). In recent years, lactic acid bacteria producing bacteriocins have received more importance for their potential application as biopreservatives in food industry (Stiles, 1996). In this study, we have analysed the biopreservation ability of bacteriocin producing probiotic bacteria isolated from curd to prevent the growth of bacterial pathogen in fish tissues. Bacillus bacterial strains were isolated from curd and it was used as source for bacteriocin. Serially diluted curd sample was plated on MRS broth and 20 morphologically different bacterial colonies were isolated and they were named as KY808480 to KY808499. All the 20 isolates were subjected to agar welldiffusion assay to screen the potential strains with antimicrobial activity against seafood pathogens Salmonella sp and Vibrio sp that are isolated from infected fish tissues. Based on their zone of inhibition, one potential strain (KY808492) which showed the maximum activity of 10 mm, 6 mm against both the tested pathogens were selected for further study (Table 1). Then, the parameters required for the maximum growth of the selected strain was optimized as suggested by (Wilson et al., 2016). The maximum growth was observed at pH 7, 25°C, 1% salinity, 3% starch as carbon source and 3% beef extract as nitrogen source after 24 hrs of incubation at 37°C. The growth range of Bacillus sp in the modified medium was found to be higher than the normal MRS broth (Graph 1). Therefore, the modified medium has been used to grow Bacillus sp for the further assays. Table 1: Zone of inhibition of probiotic strains against seafood pathogens. 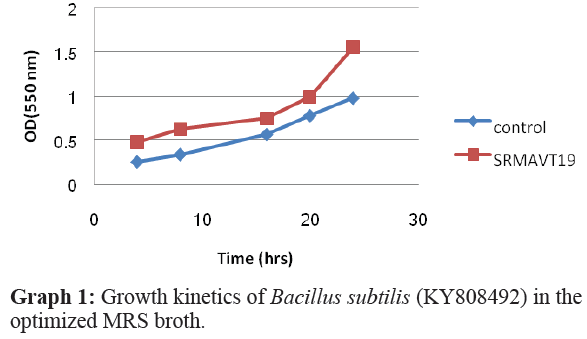 Graph 1: Growth kinetics of Bacillus subtilis (KY808492) in the optimized MRS broth. The screened potential probiotic strain KY808492 was identified as Bacillus subtilis by 16SrRNA sequencing (Figures 1-7). According to previous reports, Bacillus sp was considered as one of the important species with significant broad range of antimicrobial action against bacteria and fungus. Also many strains of Bacillus sp have been reported with potential bacteriocin producing ability. But the prospect of using bacteriocin produced by Bacillus sp as biopreservative to preserve frozen fish tissues have not been studied. Therefore, this study aimed at analyzing the biopreservative ability of the bacteriocin purified from the selected Bacillus sp strain. To confirm the bioactivity of the partially purified bacteriocin, well-diffusion assay was performed against both the bacterial pathogens. Interestingly, higher antimicrobial activity of 12 mm and 18 mm was observed in purified bacteriocin than the crude extract (Table 2). This specifies the bioactivity of the purified bacteriocin against both the fish pathogens, Salmonella sp and Vibrio sp. Figure 1: Molecular weight determination- SDS-PAGE. Figure 2: Antimicrobial activity of purified protein bands against Vibrio sp and Salmonella sp. Figure 3: Biochemical tests of Bacillus subtilis (KY808492). Figure 4: Sugar fermentation test of Bacillus subtilis (KY808492). 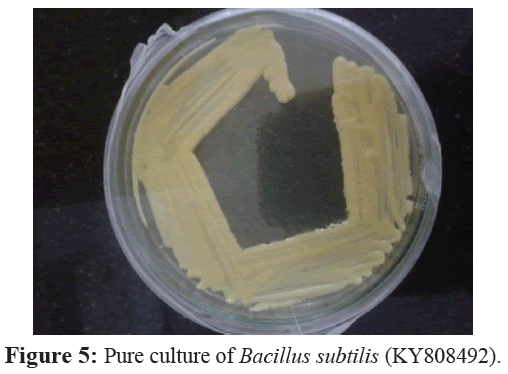 Figure 5: Pure culture of Bacillus subtilis (KY808492). Figure 6: Microscopic view of Bacillus subtilis (KY808492). 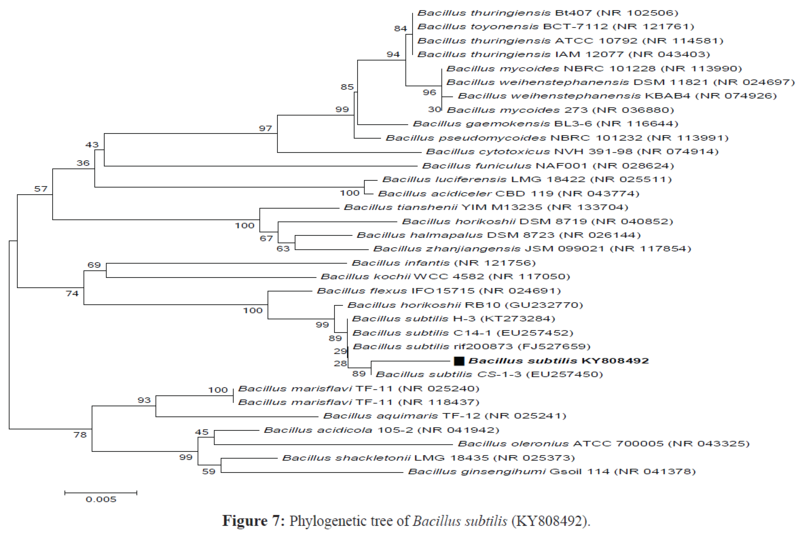 Figure 7: Phylogenetic tree of Bacillus subtilis (KY808492). Table 2: Zone of inhibition of purified bacteriocin against seafood pathogens. Molecular weight of both the crude extract and the partially purified bacteriocin has been determined by SDS-PAGE Electrophoresis which corresponds to about 17 KDa and 20 KDa (Figure 1). 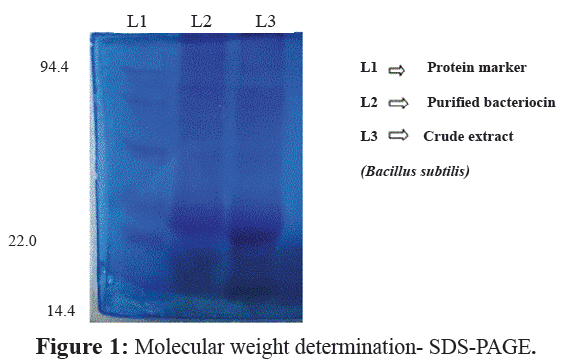 The one prominent band of purified bacteriocin in the SDS-PAGE was cut and the antimicrobial activity was determined against the isolated seafood pathogens using agar diffusion method. After incubation of 24 hrs, the clear zones were observed around the bands and it was measured up to 25 mm and 20mm (Figure 2) which confirms the inhibitory activity of bacteriocin against the seafood pathogens and the viability of bacteriocins. The biopreservation ability of bacteriocin produced by Bacillus sp in lowering the bacterial load of frozen tissues of Parastromateus niger and Loligo duvauceli with Salmonella sp and Vibrio sp infections was observed. Infected tissues were treated with bacteriocin and stored at two different temperatures (-4°C and -20°C) for 30 days and the total heterotrophic bacterial load and the counts of Salmonella sp and Vibrio sp loads were enumerated. Observations showed that after 6 days of treatment, the Total Heterotrophic Bacteria (THB) load were found reduced in the samples preserved with bacteriocin at both the temperatures than the tissues preserved without treatment. Similarly, the loads of Salmonella sp and Vibrio sp were also reduced in bacteriocintreated tissues. After 15 days of treatment, a drastic reduction in cell count was observed. After 20 days of treatment, no colony was observed whereas no colonies were found even after 30 days of storage (Tables 3-6; Graphs 2-9). But in earlier researches it was reported that the strains of Lactic acid bacteria have not been inhibited the Salmonella sp in meat products (Lozano et.al, 2002). Overall results confirmed that bacteriocin purified from Bacillus sp had efficiently reduced the total bacterial count which suggested their ability to use as biopreservative agent. Also, it should be noted that bacteriocin gets easily digested by the proteolytic enzymes present in the human gastrointestinal tract, thereby confirming that it does not cause health hazards to human body. Other bacterial species bacteriocins also have the potential to inhibit seafood pathogens and hence it can also be used as a natural biopreservative (Lasango et al., 2002; Ray et al., 2001; Wilson et al., 2016). Table 3: Microbial load in Pomfret (Parastromateus niger) preserved directly at -4°C and -20°C. Table 4: Microbial load in Pomfret (Parastromateus niger) preserved with bacteriocin at -4°C and -20°C. Table 5: Microbial load in Squid (Loligo duvauceli) preserved directly at -4°C and -20°C. Table 6: Microbial load in Squid (Loligo duvauceli) preserved with bacteriocin at -4°C and -20°C. 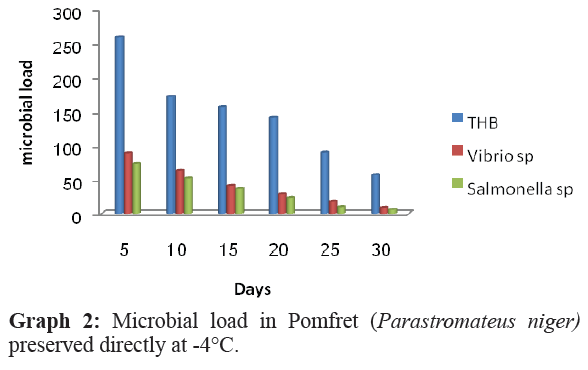 Graph 2: Microbial load in Pomfret (Parastromateus niger) preserved directly at -4°C. 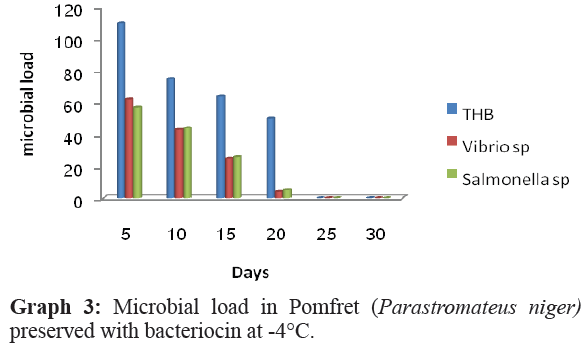 Graph 3: Microbial load in Pomfret (Parastromateus niger) preserved with bacteriocin at -4°C. Graph 4: Microbial load in Pomfret (Parastromateus niger) directly at -20°C. 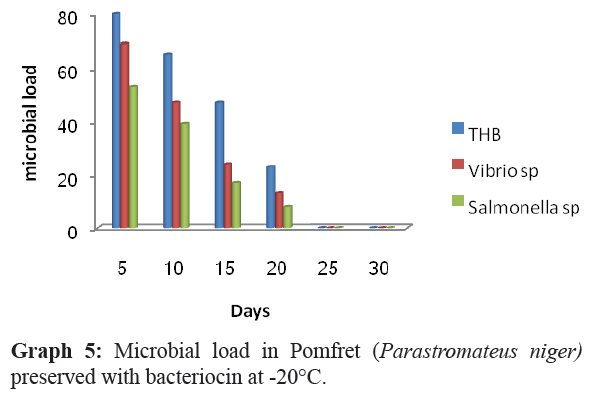 Graph 5: Microbial load in Pomfret (Parastromateus niger) preserved with bacteriocin at -20°C. Graph 6: Microbial load in Squid (Loligo duvauceli) preserved directly at -4°C. 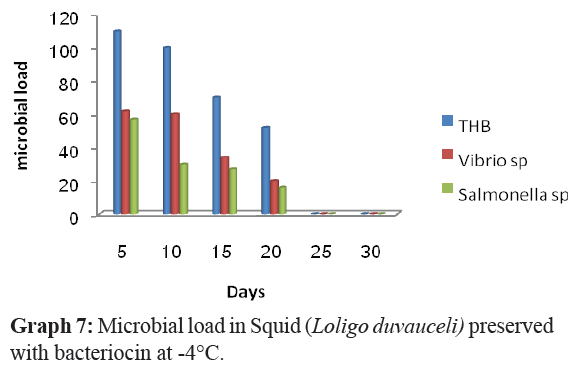 Graph 7: Microbial load in Squid (Loligo duvauceli) preserved with bacteriocin at -4°C. Graph 8: Microbial load in Squid (Loligo duvauceli) preserved directly at -20°C. 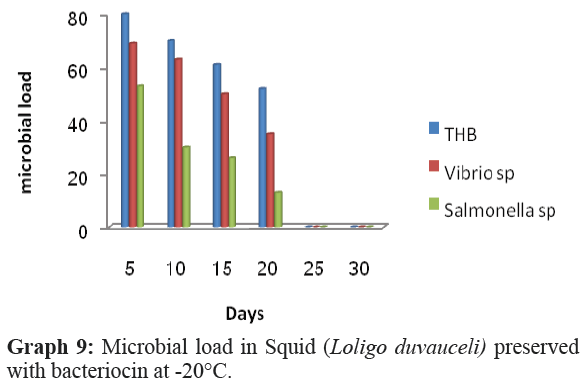 Graph 9: Microbial load in Squid (Loligo duvauceli) preserved with bacteriocin at -20°C. The results of the study, suggested that the isolated bacterial strain, Bacillus subtilis (KY808492) will play a dual role such as anti-microbial and probiotic which bring health benefits to the host and this study also proved the efficiency of bactericidal and bio-preservative activity of bacteriocin which could provide increased protection, a longer product shelf-life and acts as a better alternative for preserving the high-value sea foods. We would like to thank the facility provided by the Department of Biotechnology, FSH, SRM University to carry out this research and the support extended by Dr. Karthik Ramachandran (Technical Product Manager [Aquaculture and Fisheries] at Guybro chemical Pvt. Ltd.), Mr. Faizal. N. M (Associate Research scholar, SRM University) and the technical support provided by Sankara Nethralaya Research centre, Nungambakkam, Chennai. WHO (2002) Food safety strategic planning meeting, WHO headquarters, Geneva, Switzerland.pp: 20-22. Jeyasekaran, G., Ganesan, P., Anandaraj, R., JeyaShakilam R., Sukumar, D. (2006) Quantitative and qualitative study on the bacteriological quality of Indian white shrimp (penaeusindicus) stored in dry ice. International J Food Microbiol23, 526-533. Rassoli, I. (2007) Food preservation: A biopreservative approach. Food Global Science Books.pp: 111-136. Gillor, O., Etzion, A., Riley, M.A. (2008) The dual role of bacteriocins as anti- and probiotics. ApplMicriobiolBiotechnol81, 591-606. Jeevaratnam, K., Jamuna, M., Bawa. A.S. (2004) Biological preservation of foods-bacteriocins of lactic acid bacteria. Indian JBiotechnol4, 446-454. Roy, P.H. (1997) Dissemination antibiotic resistance. Medical Sci13, 927-933. Aymerich, T.M.G., Artigas, J.M., Hugas, M. (2000) Effect of sausage ingredients and additives on the production of enterocins A and B by Enterococcus faecium CTC492. Optimization of In-vitro production and anti-listerial effect in dry fermented sausages. J Microbiol88, 686-694. Lee, R.J., Rangdale, R.E. 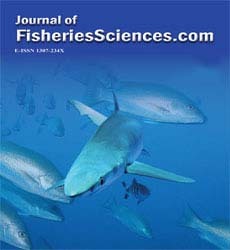 (2008) Centre for Environment, Fisheries and Aquaculture Science, UK, L Croci, IstitutoSuperiore di Sanità, Italy, D Hervio-Heath and S Lozach, Ifremer, France. Bacterial pathogens in seafood. Archimer. Herald Wilson, A.,Anjana, B., JerlinJovita, S.,Karthik, R., Muthezhilan, R., et al. (2016)Biopreservation of value added marine fishes under different storage conditions using bacteriocin from LactoBacillussp (AMETLAB27). The IIOAB J7, 1-14. Quanli Liu, GuangGao, HaijinXu, MingqiangQiao (2012) Identification of bacteriocinsubtilosin A and loss of purl results in its high-level production in Bacillus amyloliquefaciens. ResMicrobiol163,470-478. Karthik, R.,Gobalakrishnan, S.C.B.,Hussain, A.J.,Muthezhilan,R. (2013) Efficacy of bacteriocin from LactoBacillus sp. (AMET 1506) as a biopreservative for Seafood’s under different storage temperature conditions. J Modern Biotechnol2, 59-65. Galvez, A., Abriouel, H., Lopez, R L., Omar, N.B. (2007)Bacteriocin-based strategies for food biopreservation. Int J Food Microbiol120,51-70. Stiles, M.E. (1996)Biopreservation by lactic acid bacteria. Springer publication 70. Lasango, M., Beoletto, V., Sesma, F., Raya, R., Font De Valdez, G., et al. (2002) Selection of bacteriocin producer strains of lactic acid bacteria from dairy environment. Microbiologia25,37-44. Ray, W., Santivarigkna,C., Jumriangrit,P., Sonomoto K.,Panyim, S. (2001) Isolation of nisin- producing Lactococcuslactis WN C20 strain from a ham, a traditional Thai fermented sausage. Int JFood Microbiol81,137-145.